Have you ever wondered what your cat is thinking? 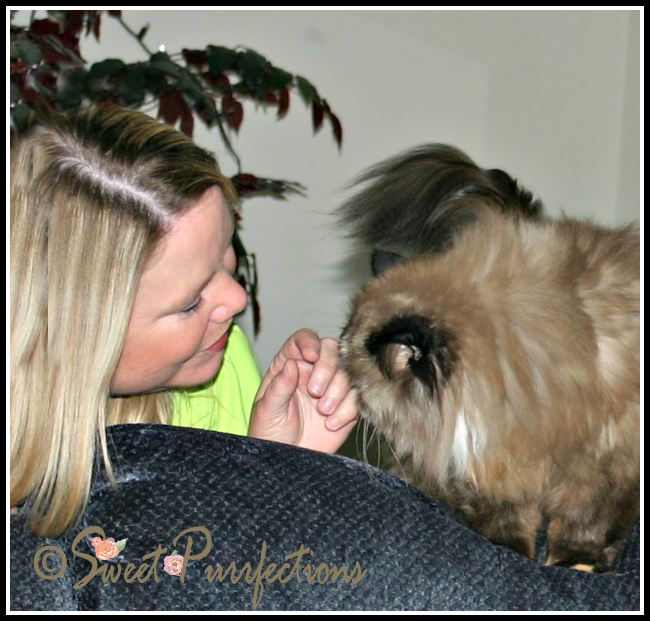 Is your cat displaying behavior that is undesirable or different? Do you sometimes feel your cat is trying to tell you something but you don't understand what? Do you have a desire to talk with a cat who is no longer with you? 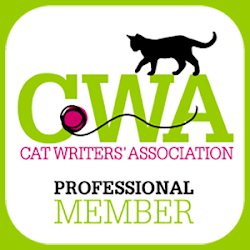 If you can answer yes to any of these questions, a session with an animal communicator may be the perfect thing for both you and your cat(s). 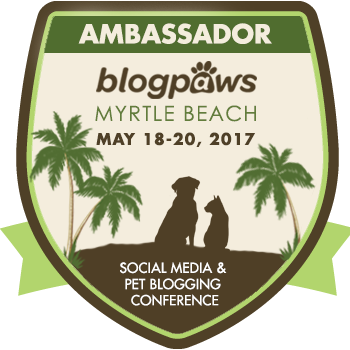 We're turning this post over to Mom Paula so she can share her experiences with animal communicator, Coryelle Kramer. Special Note: It's important to always check with your vet if your cat (pet) is showing a behavioral change or is acting different. 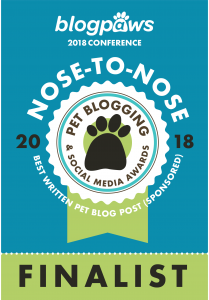 The animal communicator helped me understand the situation with my girls and develop a plan to help them, but I always have them checked out by the vet if they aren't acting normal. I want to first thank you all for giving to the opportunity to connect with Praline today. Here is what I received. "We've talked, and worked out the signals for knowing when it's time, we've said what needed to be said and we keep saying it. We've hugged and cried cuddled and nuzzled and everything is going exactly as it should. It's all unfolding purrrfectly (sorry mom I just couldn't resist!). Thank you for saying you would let me go I needed to hear that." Thanks Praline for talking with me! Coryelle's abilities made a huge impact on me that weekend and I'll always remember those words with comfort and thankfulness. Truffle and I have had a connection from the first photo I received of the litter of kittens. The way she looks at me with those huge green eyes touches my soul. 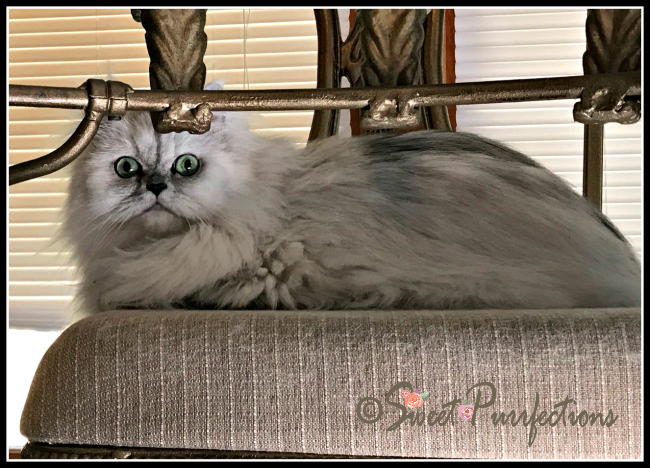 Truffle is usually a pretty confident little Persian, but recently she hadn't been herself. She was staying under the bed a lot and not her normal assured self. I reached out to Coryelle to communicate with the girls and we set up a video chat to communicate with the girls. The majority of the readings and healing that Coryelle does are long distance, either over the phone, through video chat, or through traveling astrally to you or your animal. 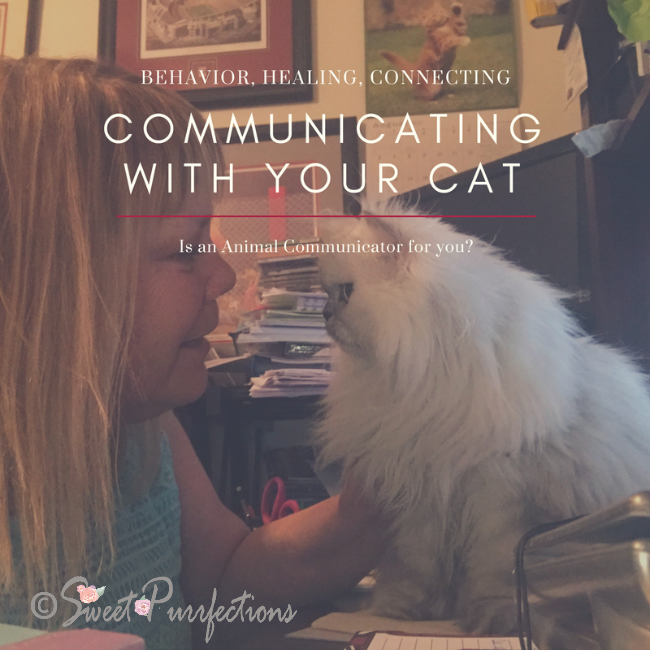 For animal communication sessions, Coryelle will quietly connect to your animal (living or in spirit), introduce herself to them (so they know who and why she wants to chat with them) then ask them if they will talk with her, if they say “yes” (which they usually always do), she gets a sense for their personalities (those in spirit too) and she tells you what your fur child is like. Once you believe she has connected to your cat, she then begins the session. ALL of Coryelle’s sessions are recorded and after your reading, you’ll receive a email with a link to your recordings on a mp3 audio file which you can save and download to your phone, tablet or computer. Truffle was the first to communicate with Coryelle. I asked Coryelle about Truffle's recent fear of thunderstorms and fireworks. Truffle communicated it was tied to a certain even and she added that she gets more time with Mom Paula when she is fearful (Coryelle laughed at this). Coryelle said Truffle was usually very grounded, practical, stable, and knew who she was. 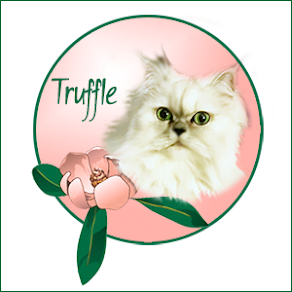 Truffle is attuned to things energetically (Coryelle referred to this as "pop rock energy") and she was unsettled recently because changes in the energy in the house. We talked about this and narrowed it down to all of the workers who had been inside and outside the house installing doors, ceiling fans, lights, a deck, and porch rails. Coryelle shared that one of the workers (she described him perfectly) brought in some negative energy that was related to a stressful situation in his life. Truffle assured us that she was beginning to feel more secure (about 75%) and that she would be okay. She told Coryelle that she'd start feeling more like herself by the end of the month. Coryelle suggested I cleanse the house energetically, using sage, sweetgrass, lavendar oil, cinder wood, or frankincense. 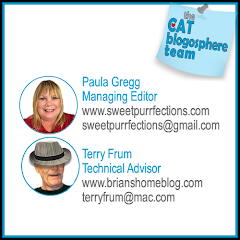 I haven't done this yet, because Truffle was getting much better (until her recent eye injury). I asked coryelle how Truffle felt about the loss of Beignet (her only littermate). Coryelle relayed that Truffle has release the pain of Beignet. She said Beignet had talked to Truffle about the pain and that Truffle knew about his cancer before anyone else. She said Truffle still feels connected to Beignet. "Hi Paula, many times beings come back at the same type of species and the same type of animal. Sometimes to bring more excitement to the mix they choose a type of animal that they have never been before. 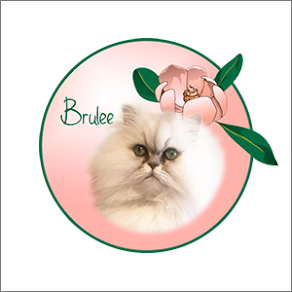 I felt like Brulee is very new to her body and is having a hard time adjusting to it." The other question I had about Brulee was about why she began avoiding eating in the kitchen about a year ago and wanted to eat under the dining room chair. I'll put food down in the kitchen and look around for Brulee and she is sitting under the chair waiting for her food. Of course, I give in and bring it to her, but she makes a mess on the carpet. Coryelle said Brulee felt more secure eating in the dining room. She couldn't narrow down what happened to cause her to eat there, but she talked to Brulee about going back to the kitchen to eat. Brulee insisted she wasn't a messy eater (not true) but she'd try to please Mom Paula. Coryelle also suggested a cleansing of the energy in the kitchen may help both the girls. The next night, Brulee actually did agree to eat in the kitchen. I was so excited and praised her. I went to turn on the TV and my new soundbar and it made a loud sound, which scared Brulee. 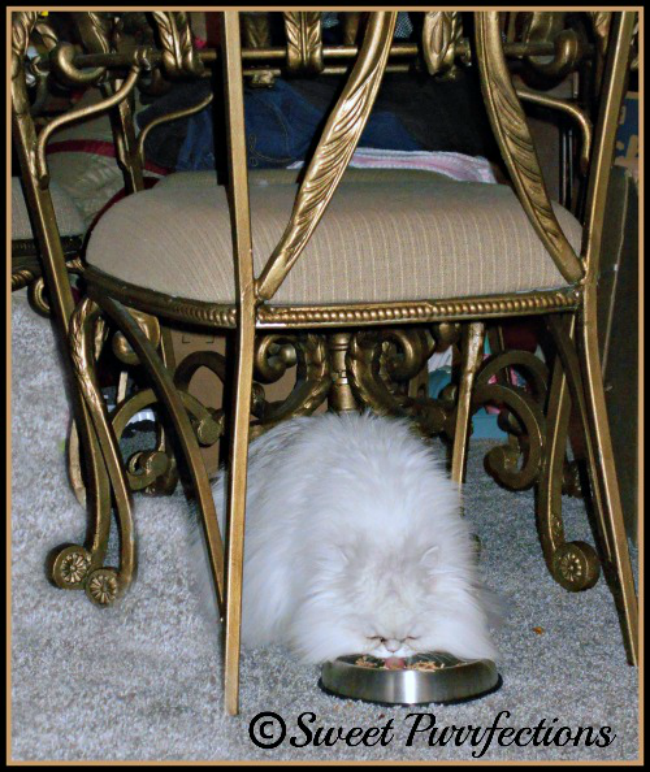 Now, she's back to eating in under the chair again. I wrote Coryelle about this and she communicated with Brulee again. Brulee told her that she gave it some thought and she didn't want to eat anywhere else but the dining room. Coryelle share that she was trying to negotiate with Brulee that we'd let her eat in the dining room once a week if she'd eat in the kitchen the other days, but Coryelle said Brulee was being very "stubborn". Coryelle advised me that the only way to work on this was to practice some tough love with her and only feed her in the kitchen. She recommended giving Brulee treats in the kitchen to show it was a safe place to eat. Coryelle said Brulee was a "little slower on the uptake" in understanding that Mom Paula is the head of the household. I'm still working on this with Brulee. She's a stubborn little Diva! We talked about other things and Coryelle even connected with Sweet Praline for a few minutes. I'll share more about that later. I must say I'm impressed with Coryelle. This was the 5th time she's talked with one of my cats and each time she provided insight that helped me with the girls. You can read more about Coryelle on her website and set up an appointment. 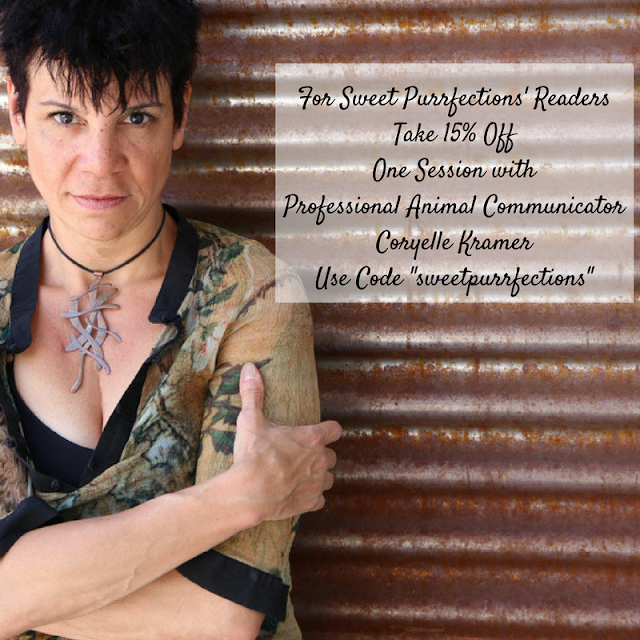 Coryelle has graciously agreed to offer a 15% discount to our readers for one session with your pet. 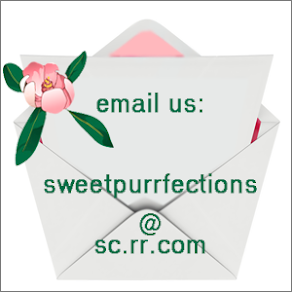 Use the code "sweetpurrfections" when booking your session. "Brûlée will be fine; she just is concerned about T and it comes out with her wanting more attention and comfort. Those are no alley cats you have Miss Paula (as you know) - they are Divas for sure :-)"
Wow, what interesting readings you've had with Coryelle! I wonder what she would have to say about me that my human doesn't know. I had absolutely no idea that there were animal communicators. Seriously just blew my mind. I am a sensitive actually, but never thought about using it in that way to that depth! Coryelle certainly has a handle on how to communicate properly with cats. I'm sure she's just as good with dogs (if you like that sort of thing, LOL). Since I have both a dog and a cat, I'll need to locate an animal communicator who is bi-lingual! Wow, thank you for sharing your experiences with Coryelle. I bet having her to talk to and help you interpret what was going on with your cats was a huge relief, especially the first conversation about Praline. I'm so glad she was able to help you through these difficult times. Paula, thank you again for giving me the opportunity to talk with the girls, every time I talk with an animal I feel it makes me a better person and and better Animal Communicator. I encourage that to read them because just because someone or something is metaphysical doesn't always make them or it good for you. I'm happy to answer any questions that anyone has, feel free to ask me her or you can send them to my email at mail@coryellekramer.com. How interesting! The mom would love to know what we're all thinking. Coryelle did a reading for Arty Mouse for me when she first went missing and it brought me a lot of comfort. I am still waiting for my sweet Arty to come home. You were very lucky to get a reading Coryelle is an awesome animal communicator. I spoke with an animal communicator towards the end of Pip's (my first pup) life. I remember she told me how much he felt a part of the family and how he happy was to be part of our family. This was especially lovely to hear because he had such a difficult start in life. I have always thought about finding another one to speak with now that he has passed (it's been almost 4 years, but still ...). Coryelle sounds wonderful. That is just utterly amazing! 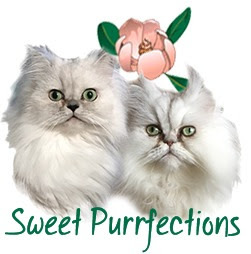 We are having some behavior problems with the Siamese we adopted recently I wonder if something like this would help. Thanks for this interesting info. Hi Lorie, I've helped a great deal of animal who were exhibiting unwanted behaviors, I usually talk to them first to discover the reason behind the behavior (it's never just because, there's always a reason) that usually works (all we all want is to have our voice heard :-) ) But then if I get a sense that more is needed I let you know flower essences (all natural healing) that will help them alleviate the behaviors. Or if I get a sense that there's something you can add to their food or that there's something going on physically in their body I'll let you know that too. Anything physical I always tell my clients to have everything I've told them double checked with their vet. I loved this! 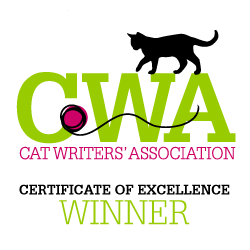 I have used animal communicators in the past, and they have always brought me comfort. I can relate to Brulee's "body issues" as I feel exactly the same. I don't know if I signed up for this planet... but some days I wish I could get a refund! LOL. Great read! That's very interesting that you know about how the cats communicate, and really sorry to hear about the struggle with the cancer. Thank you. 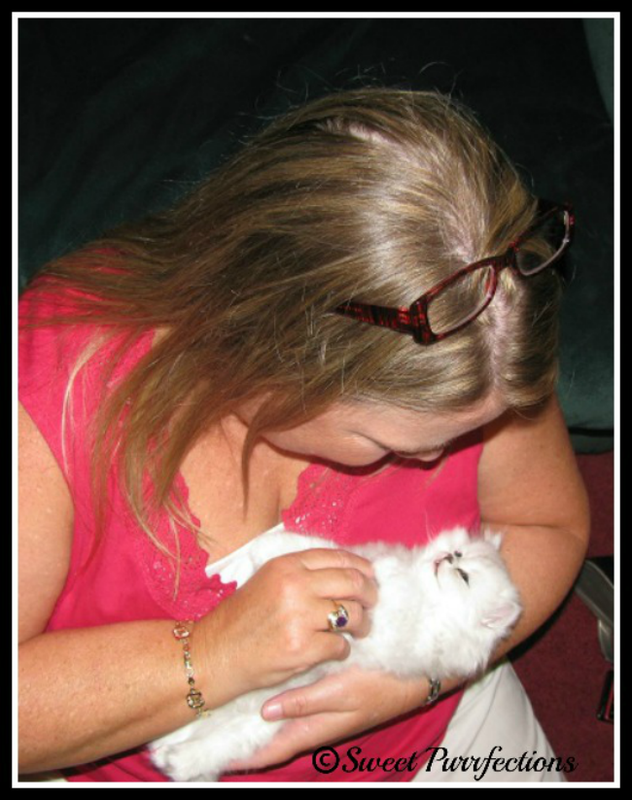 The cancer was with my previous cat, Praline, and it was six years ago. Paula, this must be one of your best posts! Informative, honest and clear eyed. An animal communicator like this, who I know you trust, might have given us insights into Dusty's behaviour. I will keep Coryelle's details on file in case we need her help. What a lovely post. Coryelle sounds really in touch with animals. 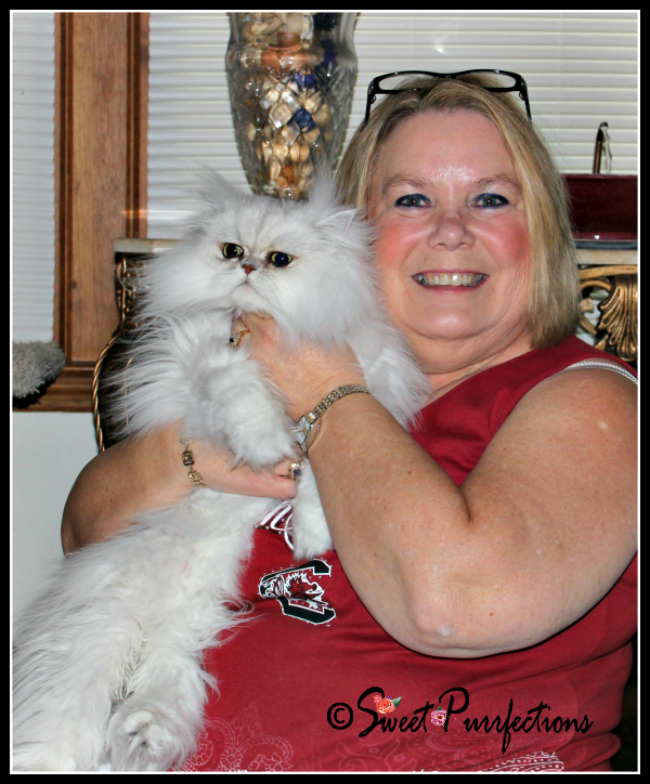 By the way, I especially love that first photo of Mom Paula and Truffle. So sweet! I'm the science-fiction book nerd who is usually quite comfortable with the idea that almost everything can be explained through science, logic, research, etc. But reading about your experiences with an animal communicator, especially the message from Praline, gave me chills. Thank you fro sharing your experiences and reminding me that not all experiences can or should be explained. I have my doubts about this. Sorry. That is amazing! I'm pretty skeptical about things like this, but Coryelle was so spot on with Praline, it makes me think, "Well, it's possible, isn't it?" Thanks for sharing your experiences. What an amazing experience! I truly believe in people's abilities to communicate with animals and I find it fascinating. I'm going to reach out to her because I'm having trouble getting Lola to eat. Thanks for sharing this with us.